Travel Umbria: Saint Francis's Life: Was All That Suffering Necessary? Saint Francis's Life: Was All That Suffering Necessary? Way too long time has passed since the last post...almost a month! I cannot believe the things that happened during this time, and my trip to Umbria lengthened the space between posts even more. I am happy though as I will be able to talk about plenty of things in first person, my experiences with the people and the fantastic places of this small region in the heart of Italy. Umbria is living its month dedicated to Saint Francis from Assis. Do you know who he is? I am pretty sure you do, but just in case you do not, here is a small overview of this saint's life and contribution to the world, and not only to the Christian Catholic religion. Saint Francis was born in a wealthy family of silk merchants in Assis. The father was often away for work, especially in France, and at his return from a business trip he found that his wife had given birth to the son they were awaiting, and changed his name to Franciscus in honor of France. Franciscus grew up to be a well to do kid, spending his father's wealth as much as he could, until the moment he departed for the third crusade to the "Holy Land". At his return from Jerusalem he felt the urge to change life. He no longer found any pleasure in banqueting and drinking with his friends. After abandoning his "dolce vita" companions, he centered his eyes on the beauties of the nature around Assisi, and found it was a way of exalting the creator God that gave life to his "sisters" and "brothers". He in fact started calling all things with the title of brother if referred to masculine nouns, and sister if feminine. Sister Moon and Brother Sun are an example of this. Altogether with a change in life views he also started repudiating his father's richness. It is emblematic when in the middle of the square he remained stark naked giving all he had back to his father, who was deeply against the son's changes. From this moment on, and for another twenty years until his death, Francis lived a life of extreme poverty, without shoes, little clothing and food, and constantly punishing his body as he considered it the means to sinning and the cage of the soul. He was even used to call his body "brother body donkey" as a way of remembering himself how much he despised it. He punished it so much that he got severely hill and died at 45 after a life of extreme sufferance. During the last two years of his life he also received the stigmata. 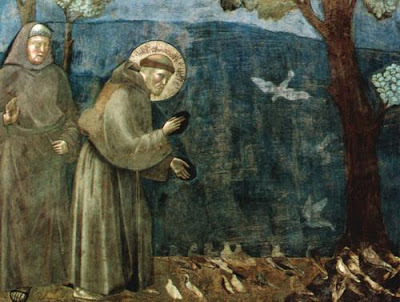 What are the teachings of Saint Francis? I am far from being able to give a theological opinion, but after being raised a Catholic and having believed him a true saint, I now see how his legacy may have also brought much harm to our society. If on one side Francis taught us that the essence of things is always to be preferred over a life of endless accumulation of ephemeral wealth, on the other he has completely misunderstood the role of body and soul, even within the realm of Christianity, if not on a pantheistic scale. The way I see it, very simply put, the body is not the cage of your soul. On the contrary, it is one thing with your soul. If the concept of soul makes you uncomfortable, let's call it your true self. When you punish your body you are really punishing your true self. If Saint Francis felt the urge to do it, and felt better after doing so, that is more attributable to some sort of self persecution or even schizophrenia, and has nothing to do with religion. If one were to behave as he did he would be forcibly treated in a hospital and spend years in analysis. Just like light, our body behaves like matter and like energy at the same time. The Catholic religion has mistakenly interpreted Jesus' teachings for centuries, and probably even exploiting them. The fact that Jesus reached his aim in life suffering and dying was merely to show that, though a mortal man, he did achieve great things in life (and I am not talking about miracles), reaching the heart of many. Christ's suffering was twisted to make pain the mean through which you can achieve a good life and perhaps sanctity. This syllogism only produced a series of silly moralisms, deep frustration, and even religious fanaticism. I feel deeply sorry for Saint Francis and his devotion to pain and deprivation. I do not entirely reject his life, as many concepts were innovative and taught many rules for a better living and reciprocal understanding. However, he is one of the many responsible for the great divide between our inner selves, and gave great strength to the church's aims of controlling poor ignorant masses through fear for centuries. Cultivating your happiness through the simple enjoyment of everyday life, cherishing your body, is a much faster way to becoming a serene person, much more likely to create well being for yourself and others. I would love to have your opinion on this. Please comment!